There is something magical about a poolscape at night. When the sun sets, a different vibe takes over the scene—something romantic, more intriguing. This is one detail that needs proper management because it actually enhances the other amenities found throughout the outdoor space. Professional landscape lighting experts begin by studying an outdoor space and determining the best method of producing the perfect nighttime experience—starting with safety. Proper outdoor lighting provides guests with a sense of well-being, which is why the right amount of lights along paths, steps, and around the pool itself is imperative. Once safety concerns are resolved, the designer will create the drama. 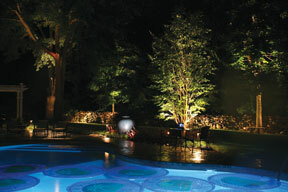 From uplighting the surrounding landscaping to artfully placing in-pool LEDs, lighting plays an important role in a backyard environment.